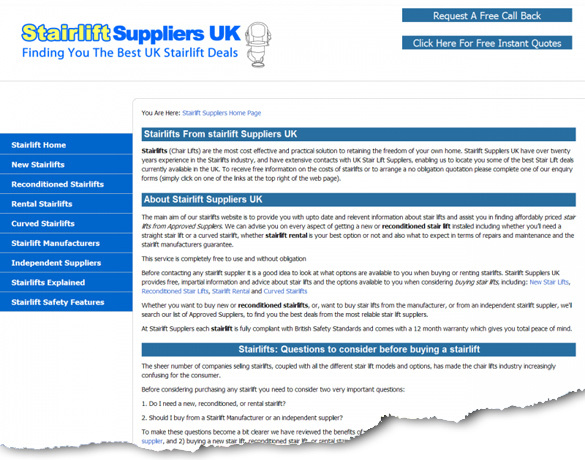 Stairlift Suppliers approached us regarding their existing uk stairlift supplier site. They were interested in improving their Google ranking for their website. The domain name is a great advantage, as it contains the main search terms they are targeting, something to bear in mind if you are setting up a new site. After we had carried out a review of the site, their current rankings and popularity, we recommended some changes to the link structure and navigation of the site. The domain name of the site was also a big advantage with this project. The site also needed a few more backward links set up for it, so we sourced these for the client, over the period of a few weeks.